As the days warm and the outdoors beckon there’s no better way to shake off the cold weather blues than with a ride on your bike. Take along someone important to you and pack a picnic for two. Chef Cathy Zeis provides the recipe for a successful outdoor dining adventure. As always, it’s easy to prepare and healthy to eat. In a large pan over medium heat, sauté pepper in oil for three minutes, stirring occasionally. Add all other ingredients except wine and Brie and stir to incorporate. Lower heat and cook for two minutes. Slowly pour in wine and stir. Cook for another two minutes and remove from heat. Let stand for 30 minutes. Spoon chutney over Brie and serve. In a large pan over medium-high heat, grill chicken breast in oil. Cook for 4 to 5 minutes per side or until juices run clear. Remove chicken to a plate and let rest for five minutes. Slice chicken breast into 1/2” thick slices. Set aside. In the same pan that the chicken was grilled in, add Caraway Havarti cheese, peppers and basil to the juice left in the pan. Cook over medium heat, stirring occasionally until cheese melts. Fold in chicken strips and stir to incorporate. Remove from heat and let rest for five minutes. 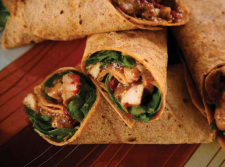 Place a sun-dried tomato flour tortilla onto a flat surface and cover with fresh baby spinach. Spoon 4 TBS. of chicken mixture onto the spinach and roll tortilla tightly. With the fold side down, diagonally slice wrap in half. Wrap tightly in foil to keep the wraps warm for serving. In a large pot over high heat, cook pasta with olive oil for 10 minutes or until pasta is al dente. Drain pasta and set aside. Cool for 15 minutes. Transfer cooked and cooled pasta into a large bowl and add all other ingredients. Stir to incorporate. Cover and chill in the refrigerator for at least 1 hour before serving. *Hint: This salad is better if you make it a day ahead of time. Doing this will allow even distribution between all the wonderful flavors throughout the salad. I cannot take credit for this one. Mom’s Bakery donated the Lemon Bars. Mom’s is located at 1703 N. Woods in Sherman. If you want these great bars call 903-893-7585. Sorry, they don’t share their recipes. For our picnic we selected three wines by Grayson Hills Winery. Texas Tapestre red table wine, Texas Twilight white table wine, and Texas Barn Red, a sweet table wine. Our personal favorite was the Twlight white. It is a semisweet with tropical fruit notes blended with Traminette, French barrel-aged Sauvignon Blanc and a touch of Texas Muscat Canelli.